SPACE STATION will be the closest most of us may ever get to reaching 354 km above the Earth's surface, orbiting our home planet at 28,000 km/h. You will blast off into space with the Space Shuttle crew as they travel towards the International Space Station (ISS) into the first permanently inhabited scientific research station. The ISS is a unique partnership of 16 nations who together are building a laboratory in outer space - a permanent facility for the study of the effects of long-duration exposure to microgravity and the necessary first step towards the global, cooperative effort needed if we are to go to Mars someday. 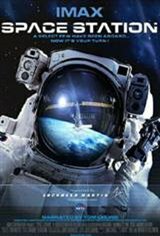 Narrated by Tom Cruise, SPACE STATION is the first cinematic journey to the ISS. As shocking as it is serene, eerie in its stillness, and dizzyingly magnificent, SPACE STATION Launches you into a world never before seen...and never before experienced like this.